The book The Servant: A Simple Story About The True Essence of Leadership, written by James C. Hunter, brings out timeless principles of leadership and integrity in a story form. The story is about a man named John Daily who has his priorities mixed up. At the insistence of his wife he reluctantly agreed to go on a week-long spiritual retreat where he would have an experience that turns his life around. The story itself is only somewhat engaging, and has several unfinished threads. However, the thoughts and principles taught are valuable and make it worth the (quick) read. The author talks about the old paradigm of leadership where the employees (‘grunts’) are at the bottom of the pyramid, and as you move up you have supervisors, middle managers, vice presidents and the CEO. He turns that paradigm on its head and shows an upside-down pyramid with employees at the top, on down to the CEO. Through this point of view he shows how true leaders serve the people who work for them, and the front-line employees serve their customers. The role of a leader is not to rule over other people, but to serve them. With the paradigm shift in place, the author uses another inverted pyramid to describe the Servant Leadership model. 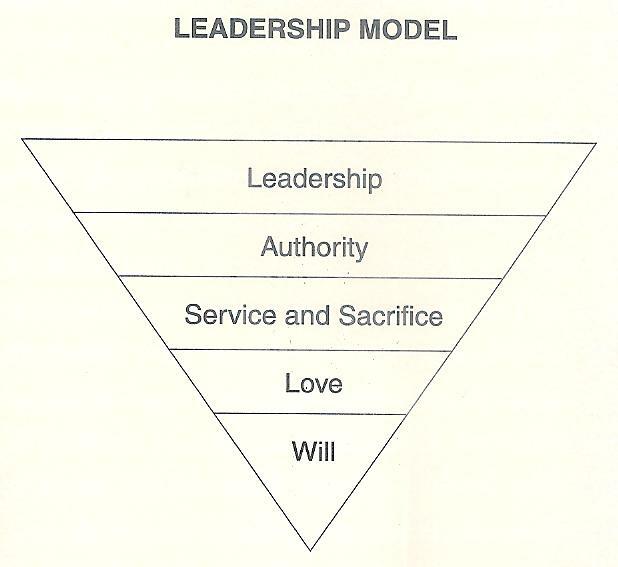 At the bottom is will, then love, service and sacrifice, authority and leadership is at the top. According to this model, the first step toward leadership is will, having intentions + actions, or aligning intentions with actions and choosing the appropriate behavior. With the proper will you chose love, the verb (in this case) that means identifying and meeting the legitimate needs (not wants) of those being lead. The next step in the progression is to serve and sacrifice for others. Through service one builds authority or influence with people, and once that is established, one earns the right to be a leader. The greatest leaders, therefore, are the ones who serve the most. Leaders create the proper conditions for growth to occur. One important way they do this is through service. The Product Management Perspective: Product managers face an interesting challenge: they are (usually) responsible for the success of their products, yet the people they rely on to get their products successfully out the door do not (usually) report to them. This situation lends itself to servant leadership. This does not mean that product managers should run around doing whatever the Dev/Marketing/Sales/… manager tells them to do. Instead they must build relationships of trust with their teams and find ways to do things for them that will demonstrate their intentions to work together for success. Categories: Integrity, Leadership, Learning, Product Management, Purpose, Trust | Tags: authority, influence, paradigm, sacrifice, servant leadership, service, success | Permalink.